It is impossible for the ANC to control the words and actions of every single member and supporter. What is expected however, is for the party to do far more than issue statements like "we distance ourselves", writes Redi Tlhabi. Book burning and banning – the favourite pastime of dictators the world over. From Nazi Germany to repressive communist states like Stalin's Soviet Union; from the goons who painstakingly constructed the vicious apartheid state, to the military rule of Nigeria's Sani Abacha, making an enemy of writers and activists is the bedrock of tyranny. It is the paranoia of failed and failing leaders to suppress the flow of information. If this is not confirmation of their fragility and inadequacy, then I don't know what is. The fact of the matter is that a book can never be damaging to one who is not already damaged, by his or her own actions. 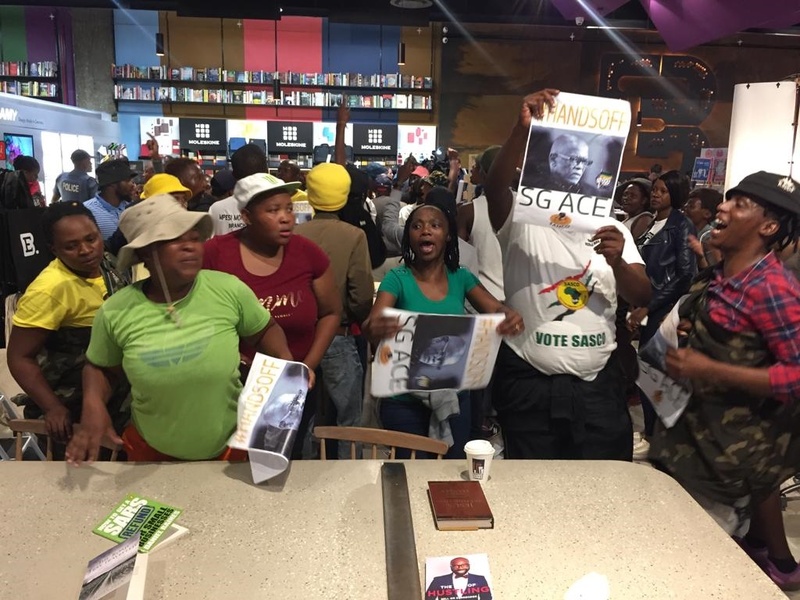 The now famous book by investigative journalist Pieter-Louis Myburgh, Gangster State: Unravelling Ace Magashule's Web of Capture was elevated to greater heights by a mob of ANC members who went on a rampage of destruction at the Exclusive Books launch in Sandton. They stormed the launch, called for the book to be banned and continued to damage books that were on display. They did this in the name of the ANC, the party that has been in government for 25 years. As it travelled along its 25-year journey in government, the party has taken some very bad offramps, caused serious crashes that led to severe injuries to our constitutional democracy and disturbingly, has allowed all sorts of miscreants to hop on the train and stay on the journey. It has embraced and allowed them to influence the direction of the organisation. The party founded by luminaries and stalwarts, built by women and men endowed with a formidable intellectual and moral pedigree, is unrecognisable. It is impossible for the ANC to control the words and actions of every single member and supporter. Nobody expects them to do that. What is expected however, is for the ANC to do far more than issue statements like "we distance ourselves". No, sorry, you cannot just "distance yourself" from the hooliganism of your members, who have clearly stated that they see the book as being a deliberate design to thwart your election fortunes as a party. Parents in a home don't just "distance themselves" from the actions of their children. The pope cannot just "distance" himself from the actions of his bishops and priests. And "this was not done in our name" also doesn't cut it because it was actually done in the ANC's name. Sturdier action is required. Like naming the Free State members and Youth League leadership who appeared on television, boldly and proudly committing acts that are incongruent with our democratic principles. By now, we should have heard that the scoundrels have been called to Luthuli House and that disciplinary action will resume. Just like action against former Youth League leaders Julius Malema and Floyd Shivambu was swift, visible and final, the storming of Exclusive Books and shredding of books require similar action. I repeat, that the ANC cannot control the actions of every single member, but once those members are known, it is incumbent on the party to take action. So far, the ANC has established a pattern of showing an unhealthy appetite for wrongdoing and, more disturbingly, creating unlimited space and freedom for the wrongdoers to cause mayhem and escape without censor and accountability. The act of "distancing" itself has created some paralysis within the party where transgressions are brushed off and the actual moral identity of the party is not well-defined. What does the party actually stand for and what actions does it find intolerable? "Distancing ourselves" is actually a misnomer for paralysis and nonchalance. Let's for a moment remember the brutal political assassinations in Mpumalanga. Body bags piled up in the battle for tenders and positions and this caused no ructions at all. It was business as usual as the party "distanced" itself. With every act of overlooking repulsive behaviour and brazen criminality, the party has gradually built a culture, a way of doing things. Eventually this is entrenched and solidified as normative behaviour. "Distancing" is also a cowardly way of avoidance. But the party, if it is to survive in years to come, must reflect on its identity. It must hold a mirror to its face and ask some difficult questions: What calibre of supporter are we attracting? Why are our supporters not afraid to act without a mandate? (If indeed they were not given a mandate.) Why is our movement so fragile and afraid of dissent? Are we a party that will now survive by violence and chicanery, rather than the strength of our ideas and moral compass? Failure to ask and answer these questions will result in the ANC being a party of quantity rather than quality; a party that utilises might, rather than ideology, to get ahead. The party cannot evade culpability when its members choose to publicly act out practices and cultures that are harmful and toxic. In some quarters, destroying books, storming book launches and calling for the heads for writers are seen as "not that deep". Followed by "you guys are overreacting". Nobody who reads enough, thinks enough can utter such detachment. History is besieged by demolition that began with an attack on ideas and institutions. If those in power start to believe that their ideas and truths are so fragile that they need force to protect them against the ideas and truths of others, then we are on a slippery slope.